So guys, this is the unknown beauty.. Amazing blue crystal sea water in an island which was called the black island. It’s called so because 200 years ago, it was still the unknown, untouchable by the outsiders. This time I travel to Raja Ampat, Bird head of Papua New Guinea which is the Indonesian part, located in the northern of Australia. To be able to visit Raja Ampat, what you gotta do is to fly to a city called Sorong, it’s located in West Papua, Indonesia. Raja Ampat is one of the best diving destinations in the world. It has attracted lots of divers to enjoy the underwater beauty. Therefore, the new airport building had been built, and direct flights from Jakarta (the Capital City of Indonesia) to the airport Domine Eduard Osok Sorong are available. 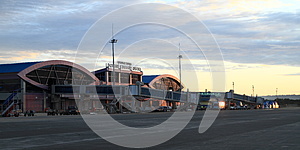 But there are also some flights with transits which can take up to 6-7 traveling hours from Jakarta to Sorong. 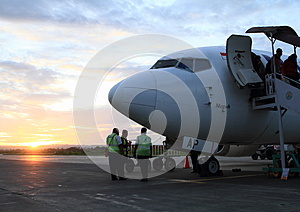 Flight from Jakarta to the eastern side of Indonesia usually take place in the late night to the early morning. If I remember well, the direct flight took around 4-5 hours. It was so awesome when we arrived and were welcomed by the sunrise as if it said enjoy my beauty and light. It was kinda warm in the morning and at the day time was really hot, but the humidity is high enough so you can breath easily. The journey was not over yet, to go to Raja Ampat we had to take another boat trip. If you stayed at the resort, they would be able to pick you up directly from Sorong. The pick up service from Sorong is usually expensive, especially for a solo traveler. The harbor to where you will go to Raja Ampat is called Pelabuhan Rakyat Kota Sorong which is the place for small ships and ferry. Be careful, here in Sorong they have 2 harbors, the other one is for big PELNI ships which are going to another city. So we went to Waisai (city center of Raja Ampat) by the ferry for about 2-3 hours. 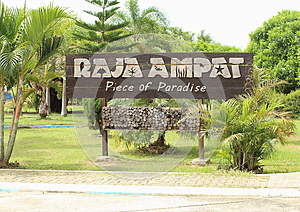 You will have to pay for the entrance fee to the Conservation Area of Raja Ampat. The price is around 90-100 USD and half price for the domestic tourists. Afterwards you will get an entrance card which is valid for a year. This fee you will pay in Waisai. I stayed in an island near by Waisai called Kri Island .The pick up service from Waisai to the Bungalow is available, which is for sure cheaper than from Sorong. It took around 30 to 45 minutes to go to Kri Island. It wasn’t felt so long for me, the view was amazing, the water was so blue and the smell of the sea is like my favorite perfume ever. Since the eco-tourism is getting famous there, you could find lots of local bungalows and guest houses which is cheaper, and more in my opinion is also good to pay the local people for the beauty of the place where they are living. Visit our other article Where to Go in Raja Ampat, Papua, Indonesia.